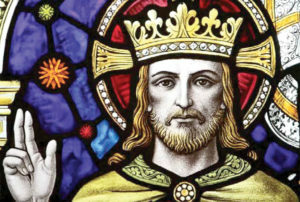 Next Sunday is the feast of Christ the King. The Church of England ‘borrowed’ it from the Roman Catholics, who first celebrated it in 1925. The pope of that era saw the rise of dictators – Stalin in the Soviet Union and Mussolini in Italy – and thought that too much emphasis was being placed on worldly power and not enough on the place of God in our lives. He believed that celebrating Christ the King would remind people that their first loyalty should be to God and that political power was transient. However, the emphasis on King may be rather unfamiliar. For British people, only a minority of the population will have a memory of a king, since Queen Elizabeth has been queen for almost 67 years. Further, the Queen and her father the last King are sovereigns within a constitutional monarchy. They haven’t reigned in the sense that mediaeval monarchs ruled or in the way that the kings of Jesus’ time ruled. To find anything approximating to the idea of kingship that would have been familiar to Jesus and his contemporaries you would have to seek out the remaining countries in the world like Saudi Arabia that have absolute monarchies. To Jesus and his original audience, though, the title ‘king’ would have been full of connotations. They would have known about their local king – Herod – and about the brutal and coercive power of the Roman Emperor. For them, kings were men with the power of life and death, exercised through soldiers and armies. For the Jews the title ‘king’ also stirred ancient memories. They yearned for another king – an anointed one, a Messiah – to reign as their greatest king, David, had in the past. David had united the kingdoms of Judah and Israel and created a holy capital, Jerusalem. After a history of deportation, exile and being occupied by foreign powers, they wanted another just and wise king. However, although Jesus spoke about the kingdom of God being ‘at hand’, he did not claim the title of King for himself. This explains why in Sunday’s Gospel, when Pilate asks Jesus if he is the King of the Jews, Jesus simply replies with another question. ,Jesus asks Pilate who put him up to asking the question. (Then Pilate entered the headquarters again, summoned Jesus, and asked him, “Are you the King of the Jews?” Jesus answered, “Do you ask this on your own, or did others tell you about me?” John 18). Jesus’ behaviour wasn’t like the kings of his day. His ‘leadership style’ was that of a servant, not a king. He rejects the temptation to be ‘master of the world’; he doesn’t lord it over his disciples and he serves them, even washing their feet. Above all, unlike all the rulers of his day and most of our own age, Jesus won’t spill blood. When Jesus is arrested he warns the disciples that those who live by the sword will die by the sword.